The International Maritime Organization adopted a ban on the use and carriage of heavy fuel oil for ships sailing in Antarctica this month, effectively meaning that beginning August 1, 2011 most large cruise ships will no longer be able to sail in Antarctica. Hapag-Lloyd Cruises’ two expedition ships, the 5-star* MS HANSEATIC and the 4-star* MS BREMEN have always used diesel fuel, state-of-the-art waste disposal systems (rubbish-incinerator and biological sewage treatment plant on board) and environmentally-friendly underwater paints (TBT-free), which will allow both ships to continue this very popular route in 2011 and beyond. Hapag-Lloyd Cruises’ expedition ships carry no more than 184 passengers. Zodiac (small motorized boats) landings, under the guidance of experienced experts who give detailed instructions to passengers about proper conduct while in Antarctica, never exceed 20 people. Hapag-Lloyd cruises is an active member of IAATO (International Association of Antarctic Tour Operators) ­ a voluntary union of Antarctic tour operators that have agreed to promote ecologically sustainable tourism in the Antarctic continent and, at the same time, benefit from the experience of the other members. 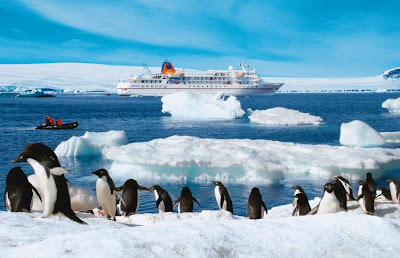 Hapag-Lloyd Cruises will be offering two Antarctica international (German/English) cruises in early 2011 on the MS HANSEATIC and the MS BREMEN. Both ships are well equipped for travel in difficult waters, with both holding the highest ice class ranking for passenger vessels (E4). Also shallow drafts and high manoeuvrability allow the ships to enter waters larger cruise vessels cannot reach. Guests explore the world’s best-kept secrets in zodiacs (small motorized boats) with only 10-12 guests. Onboard experts include a team of experienced scientists, expedition leaders and specialists who guide landings and offer guests the rare opportunity to observe plant and animal life up close. Both ships also have warm parkas and rubber boots for all passengers on-loan. The Antarctica itineraries below offers guests a once in a lifetime experience to view the gigantic colonies of birds, particularly penguins as they gather for the start of their summer in Antarctica. In addition to observing the massive bird colonies, guests will also have the opportunity to hike on the Falkland Islands, explore South Georgia, bath in the hot waters on Deception Island and observe the gleaming icebergs and whales in the Antarctic Sound. Rate: Starting at $11,710* per person based on double occupancy for an outside cabin, rate includes flights between Buenos Aires and Ushuaia. Rate: Starting at $13,640* per person based on double occupancy for an outside cabin, rate includes flights between Buenos Aires and Ushuaia. I have always been fascinated with ships that can do antarctica trips back and forth. This cruise looks good but it's very expensive. Here is prices from other companies http://poseidonexpeditions.com/antarctica/. Standart prices for this kind of cruises are near 6-8 thousands dollars.